The Madison Central Business Improvement District (BID) manages and markets the Downtown Madison Gift Certificate Program. Like a travelers’ check, the Downtown Madison Gift Certificate is a pre-printed, fixed-amount check, which is backed by money in the BID Gift Certificate account. Downtown Madison Gift Certificates do not expire. They are purchased by individuals as gifts, and by area companies and organizations as employee and customer incentives. The amount of any single gift certificate is limited to $25 or under. Multiple gift certificates may be purchased at one time. We are unable to replace lost or stolen certificates. There are more than 170 participating BID businesses. Notify the BID’s Programming Coordinator that your business will participate in the program (currently, Tim Jenquin at (608) 512-1341 or tjenquin@visitdowntownmadison.com. ). The Programming Coordinator will add your business name to the list of participating businesses on the BID’s website and on the gift certificate sleeves. A Downtown Ambassador will drop off promotional materials for you to display on your front window and/or near the cash register notifying customers you accept the Downtown Madison Gift Certificate. Accept the Downtown Madison Gift Certificates as you would a travelers’ check (although no counter-signing by the customer is necessary). If the amount of the purchase is less than the amount of the gift certificate, give change in cash. Endorse the back of the certificate. The certificate can then be deposited with all other deposits directly to your business’ chosen bank. Remember, Downtown Madison Gift Certificates do not expire. 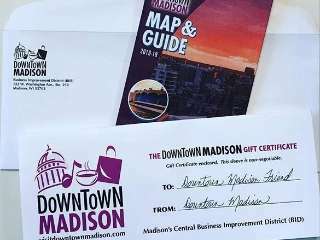 The Downtown Madison Gift Certificate looks like a check with a signature, bank information, and security features. The gift certificate sleeve is non-negotiable. Please make sure you accept only the certificates themselves. For more information contact Tim Jenquin, BID Programming Coordinator at: (608) 512-1341 or tjenquin@visitdowntownmadison.com.